This book not only remedies the paucity of literature on trans* college students, but does so from a perspective of resiliency and agency. Rather than situating trans* students as problems requiring accommodation, this book problematizes the college environment and frames trans* students as resilient individuals capable of participating in supportive communities and kinship networks, and of developing strategies to promote their own success. Z Nicolazzo provides the reader with a nuanced and illuminating review of the literature on gender and sexuality that sheds light on the multiplicity of potential expressions and outward representations of trans* identity as a prelude to the ethnography ze conducted with nine trans* collegians that richly documents their interactions with, and responses to, environments ranging from the unwittingly offensive to explicitly antagonistic. The book concludes by giving space to the study’s participants to themselves share what they want college faculty, staff, and students to know about their lived experiences. Two appendices respectively provide a glossary of vocabulary and terms to address commonly asked questions, and a description of the study design, offered as guide for others considering working alongside marginalized population in a manner that foregrounds ethics, care, and reciprocity. The author, a faculty associate in the Center for the Study of Women, Gender, and Sexuality at Northern Illinois University, offers this well-written, revealing ethnographic study of nine trans* college students and sheds light on an area of gender identity that has long needed attention, especially in the wake of an upsurge in bias crimes and a concerted effort to thwart the rights of trans* people. (It’s not just about the bathroom!) The book gives voice to the students within a broad understanding of sexuality and identity that people have tended to look at from a binary perspective (gay/straight, male/female). Such an oversimplification ignores the lives of those who are most directly affected. Because the book specifically considers how trans* individuals function within a college setting, it is especially recommended as a must-read resource for higher education administrators, faculty, and those providing support services. Summing Up: Highly recommended. Upper-division undergraduates through practitioners." 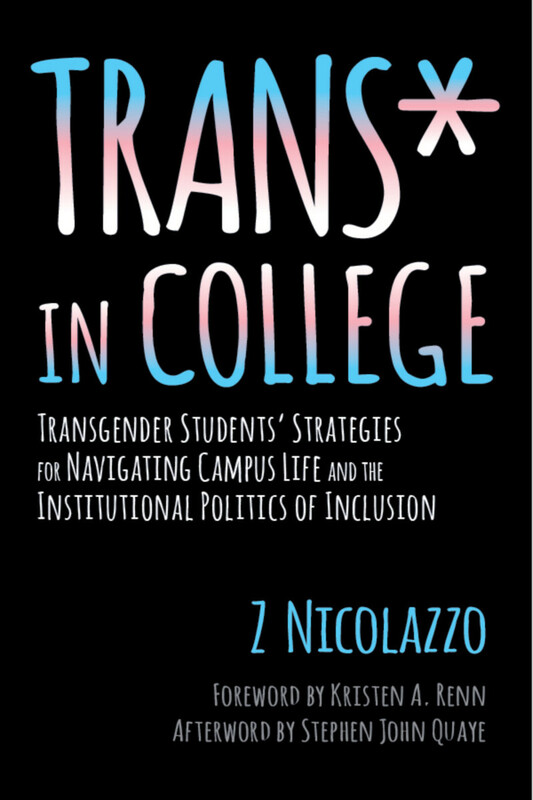 “A timely and persuasive contribution to the literature on communities on the margins of higher education, Nicolazzo offers deep insight into the multiplicity of intersectional and systemic barriers faced by trans* collegians. But this book goes far past the expected story of trans* suffering to powerfully center trans* resilience and voice. The trans* students at the heart of this work demand better from all of us. A must read for all concerned with true inclusion and change in the academy. “There has never been a more important time for a book like this one that helps readers know that trans* college students are not only possible, but they face the seemingly impossible task of speaking their stories and, in the tradition of minoritized peoples, writing themselves into existence. As is so clear throughout this book, trans* students are not impossible people in higher education. For centuries higher education has constructed itself to be an impossible place for trans* people to be themselves, to be safe, to be seen. We with power in higher education (e.g., tenured and tenure-stream faculty, administrators, majoritized students) have allowed it to be so, and benefitted from it. We can change it. We can read the stories represented in this book and we can make higher education live up to its best image of itself as an institution that provides opportunity. It’s time we see, and let them be seen on their terms, not ours." Z Nicolazzo is an assistant professor in the Adult and Higher Education program and a faculty associate in the Center for the Study of Women, Gender, and Sexuality, both at Northern Illinois University, DeKalb. Z’s research agenda is focused on mapping gender across college contexts, with particular attention to trans* collegians, as well as the intersections of race, gender, sexuality, and disability. Prior to becoming a faculty member, Z worked as a full-time student affairs professional experience in the functional areas of residence life, sexual violence prevention, and fraternity and sorority life. You can follow Z on hir website at znicolazzo.weebly.com or on twitter at @trans_killjoy.